Amarraba to Simply and Nestor! 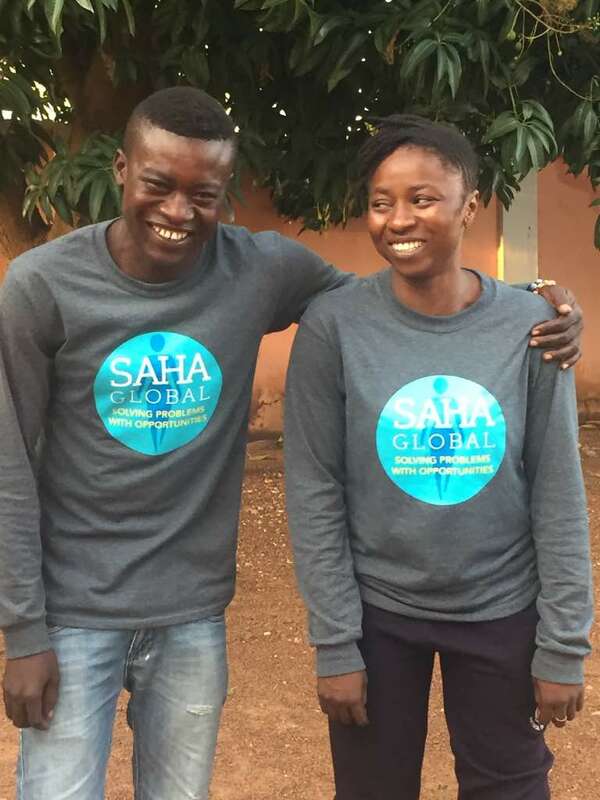 As our Field Rep Alumni already know, Nestor and Simply are quite the brother-sister duo and Saha is so excited to have them both join the full time team! Simply started monitoring with us this summer, and both officially joined the monitoring staff in September. They’re working hard alongside the rest of our team to get centers back up and running after the rainy season, and they’ve brought plenty of energy and fun to the office too! Everyone at Saha is thrilled to have the Tamale team growing, which will help us better monitor our current businesses and implement more in the Northern Region. More updates on the post-rainy season projects to come but until then let’s offer a warm welcome to Nestor and Simply! Nestor grew up in Bulpela neighborhood of Tamale. 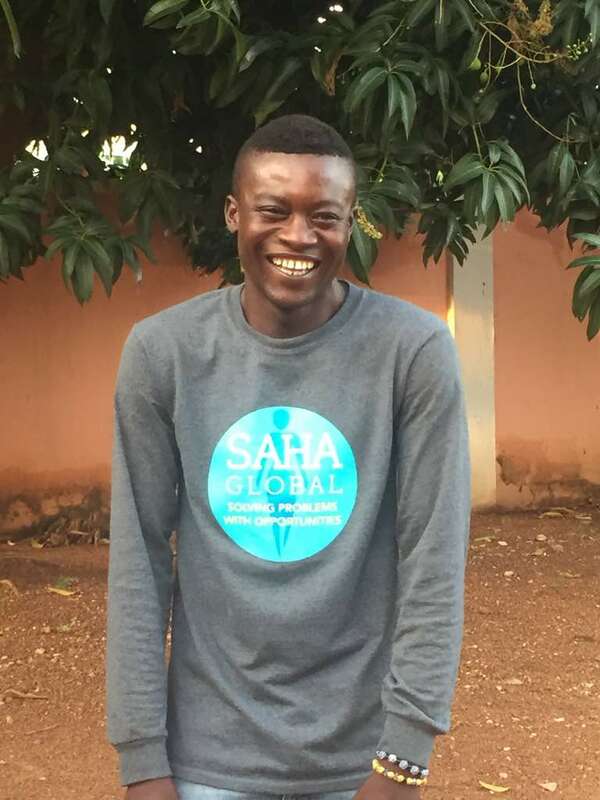 He found out about Saha through Peter, and joined our team as a translator for the Global Leadership Program in January 2012. His first Saha business was a water center in Manguli 1. Nestor joined the team full time in September 2017 as a monitor, alongside his sister Simply. In his free time, Nestor loves listening to music and dancing, and his favorite food is T.Z. and ayoyo. When the Saha Field Reps are in town, he enjoys having fun with them and the kids out in our partner communities. Simply first joined Saha’s team as a translator in January 2014, after learning of our work through Eric. She implemented a water center in Manguli 2. 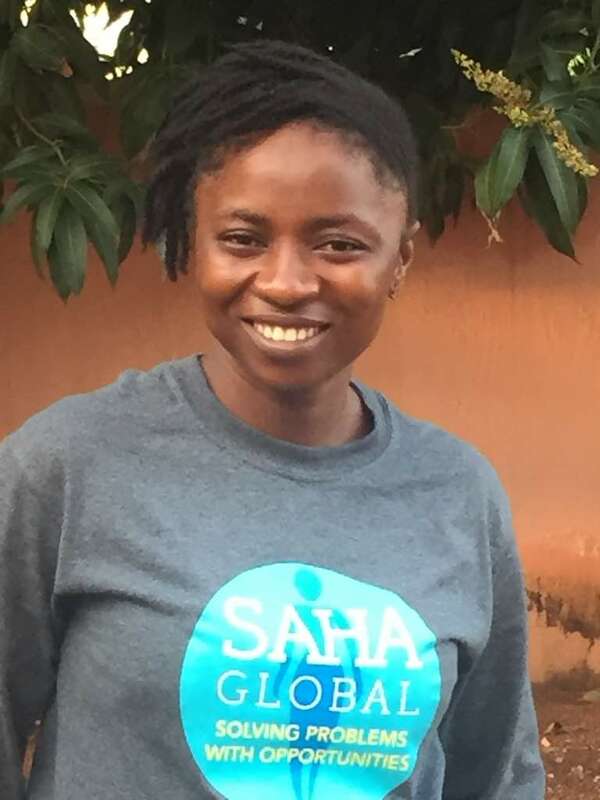 She became a full time monitor in September 2017, and says her favorite time at Saha is when new Field Reps arrive for the Global Leadership Program. Simply grew up in Bulpela neighborhood of Tamale with her brother, Nestor. Before Saha, Simply obtained her certificate in hair dressing and cosmetics. She enjoys eating banku with hot pepper sauce and fish, and she likes listening to music in her free time. For the past couple of weeks we have been working in a village called Manguli II (don’t forget the II). After spending time training our three elected entrepreneurs, Moshi, Sharatu, and Latifa, we finally opened their water business this morning! We planned to start at 10 o’clock but the day got off to a slow start which worried us a little bit. Forty five minutes later however, we saw people approaching the center with their blue buckets in hand. There were about 6 people who all arrived at once so we quickly informed them of how it would all pan out.They would first mark their buckets with their family name, then wash them and after that they would be ready to buy some clean water! The first sale made was to buy water for cleaning the safe storage container which was really exciting for both us and the women. Danya was in charge of marking buckets, Ana handled the cleaning process and Remy took charge whenever we came upon a leaky tap. Our translator, Simplicia aka Simply, played many roles as she tried to clean and translate all at once. Although the first to show came in a bit of a cluster, the rest of the day was pretty steady with people showing up one after another. At the end of the day, the women counted their sales and found that they filled 30 safe storage containers which amounted to a profit of 3 Ghanaian Cedis! Only three households in the community did not come to fetch water but it was only because they were traveling and are expected to come to the business as soon as they come back. Ana, Simply & Danya with their great opening day outfits! After two weeks of hard work, opening day showed how it all paid off. 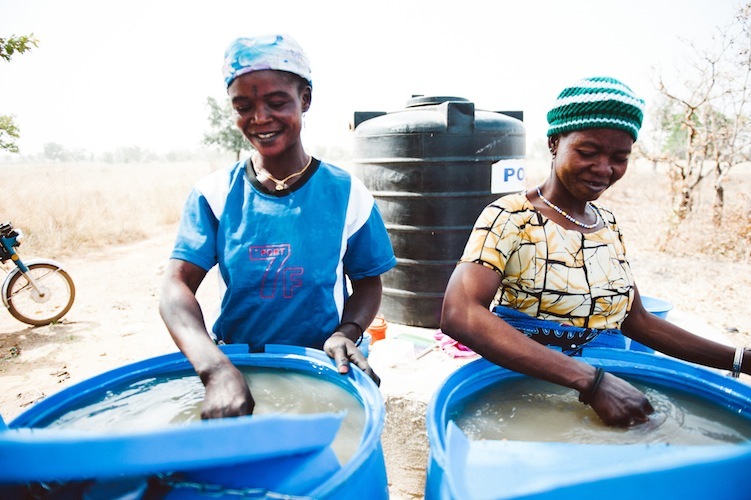 The process of bringing clean water to people in need is much more difficult than it seems. We definitely ran into a few speed bumps throughout the entire training and implementation process but after speaking with people and understanding their knowledge on the issue, it helped to bring us to our outcome today. We could see that the people who once seemed skeptical of our work were actually excited when they tasted the water and it was truly an amazing experience to watch. We really look forward to watching how everything plays out from here on and seeing how much of an impact our work has made on the people of Manguli II. -Danya, Remy & Ana B.